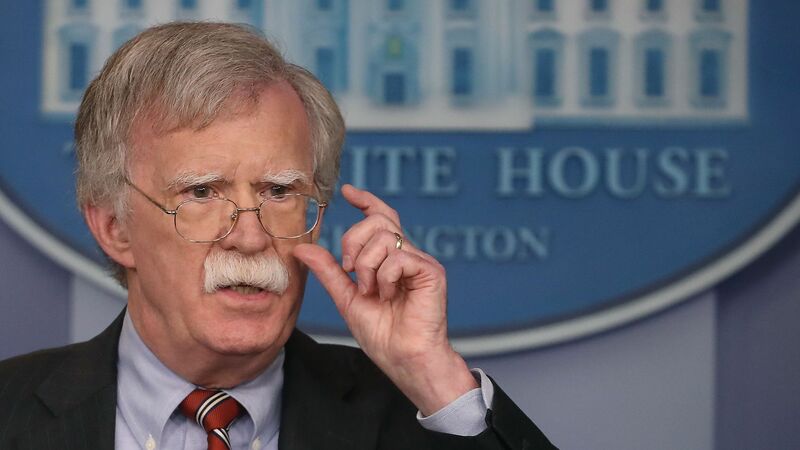 National Security Adviser John Bolton will warn the Iranian regime that there will be "hell to pay" if they "continue to lie, cheat and deceive" or "cross" the U.S. and its allies, according to excerpts of the speech he's set to give later this afternoon. Why it matters: Bolton’s speech, in which he’ll also declare the Iran deal "the worst diplomatic debacle in American history," contains some of the most aggressive and confrontational language we've seen from a U.S. administration in recent decades. Bolton has argued for military intervention in Iran in the past, and he warns in this speech: "We are watching, and we will come after you." Between the lines: The contrast with America's European allies could not be greater. This aggressive speech comes just a day after the Europeans doubled down on their commitment to the Iran nuclear deal by announcing they would set up a special payment channel to allow European companies to keep dealing with Iran while ducking U.S. sanctions. Per the WSJ: "EU foreign-policy chief Federica Mogherini and Iran’s Foreign Minister Javad Zarif made the announcement of a 'special purpose vehicle' jointly, in English and Farsi, after a meeting at the U.N. of the parties still committed to the deal — Iran, EU, U.K., France, Germany, Russia and China." Consider the optics: Bolton tells Iran "we will come after you" just a day after the Europeans did a joint appearance with the Iranians to emphasize their commitment to the nuclear deal that Trump trashed and dramatically exited earlier this year. "According to the mullahs in Tehran, we are 'the Great Satan,' lord of the underworld, master of the raging inferno. So, I might imagine they would take me seriously when I assure them today: If you cross us, our allies, or our partners; if you harm our citizens; if you continue to lie, cheat, and deceive, yes, there will indeed be HELL to PAY." "The Iran Deal was the worst diplomatic debacle in American history. It did nothing to address the regime’s destabilizing activities or its ballistic missile development and proliferation. Worst of all, the deal failed in its fundamental objective: permanently denying Iran all paths to a nuclear bomb." "The ayatollahs have a choice to make. We have laid out a path toward a bright and prosperous future for all of Iran, one that is worthy of the Iranian people, who have long suffered under the regime’s tyrannical rule." "The United States is not naïve. We will not be duped, cheated, or intimidated. The days of impunity for Tehran and its enablers are over. The murderous regime and its supporters will face significant consequences if they do not change their behavior. Let my message today be clear: We are watching, and we will come after you." The Other Side: Tony Blinken, deputy secretary of state under President Obama, told me: "The big question is whether the Iranians will stick with their obligations under the deal and try to wait out President Trump or whether the new sanctions and lack of economic benefit will give hard-liners the argument to restart the nuke program." "If so, we’ll eventually be right back at the bad binary choice between allowing Iran to have a nuclear breakout capacity or attacking them to stop it with all the risks each entails. That’s exactly the dilemma the deal solved."